Sisley-Paris Intensive Dark Spot Corrector, 0.24 oz. 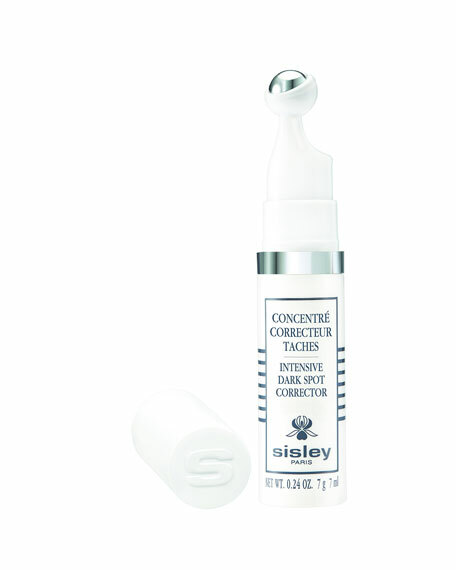 Sisley-ParisIntensive Dark Spot Corrector, 0.24 oz. Apply locally on dark spots on the face, neck, décolleté and hands. Morning and evening. Apply after cleansing and before daily skin care. Gently squeeze the base under the roll-on tip to release the equivalent of 2 drops of the product. Apply directly to all the dark spots to be treated. Massage with the roll-on tip and finish the application with fingertip. Global action on the appearance of dark spots: visibly reduces the size and intensity of dark spots after 4 weeks of use. Lightens dark spots due to sun exposure or aging but also those caused by skin imperfections. Promotes an even complexion. These results can be intensified with prolonged use over 2 to 3 months. High protection from sun exposure is essential to prevent new dark spots from appearing. Intensive anti-free radical treatment. Repairs skin damaged by the sun and environmental pollutants. High concentrations of pure vitamin C: 6%. Natura Bisse Oxygen Complex Intensive Purifying Serum, 1.